Leticia Plate has been illustrating for books, magazines and editorial publications across the US for many years. Born in Buenos Aires, raised in Rome, she moved to New York City to study illustration at School of Visual Arts. She has brought influences from multiple languages and cultures to create a unique visual language all her own. Her signature style is all about expressive line and playful color. Drawing first with ink on paper then working in color digitally. There are always elements of positivity, whimsy and cheerfulness to her pieces. 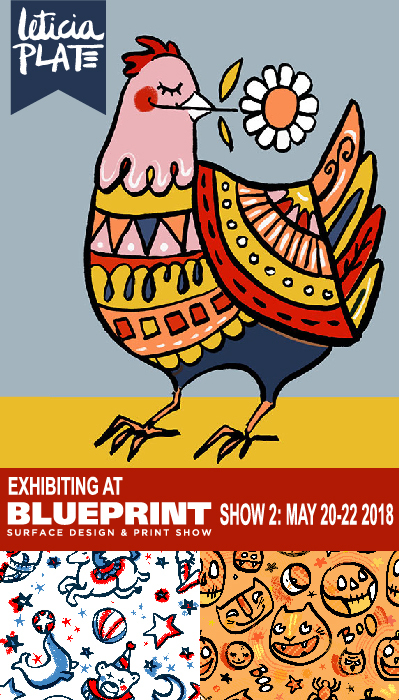 Leticia is excited to be exhibiting for the first time at BluePrint and can’t wait to make new connections and find new applications and possibilities for her work. She will be bringing a portfolio brimming with new fun florals, inventive greeting cards and of course many ways to celebrate the Winter Holidays.